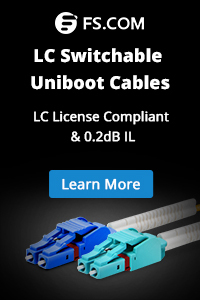 Although unmanaged switch presents a simple “plug and play” option for network administrators, it fails to meet the challenge created by the insatiable bandwidth demands. Managed ethernet switch, while has abundant advanced features for large professional networks, are far more cost-prohibitive for small- and medium-sized business (SMB) networks. Smart managed switch are somewhere in between, which has proven itself an affordable and feasible alternative to boost network performance, security and scalability for SMB. 12 port smart managed switch is the most pravalent variations on the market, so how can network benefit from deploying it? This article explains it in detail. The proliferation of big data, virtualization and cloud-based services demands SMB networks to extend beyond simple reliability to higher speed and performance. Smart managed switch is purposely designed to address the bandwidth bottlenecks faced by SMB network – it is managed switch with very limited management functions. For a much lower price than a fully managed switch it provides a web interface (and usually no CLI access) and allow configuration of basic settings, such as VLANs, port-bandwidth and duplex. Additionally, smart switch supports more advanced functions like Access Control List (ACL) and Spanning Tree protocol (STP). On a large network you may use managed switches at the core and smart managed switches at the edge – it can make an excellent transition solution when the cost of a managed switch cannot be justified. What Makes a Good Smart Managed Switch? 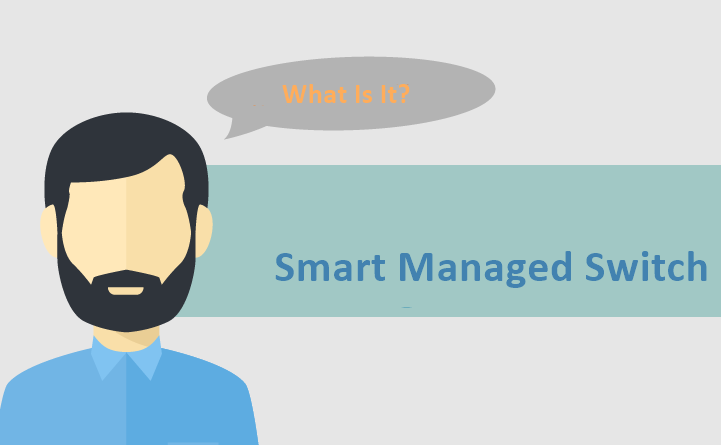 While choosing a smart managed switch, it’s mostly about two things: budget and application. As there is an abundance of smart managed switch on the market with different features, FS 12 port smart managed switch S5800-8TF12S stands out by offering enhances reliability, simplicity and affordability for SMB neworks. FS S5800-8TF12S 12 port smart managed switch offers 8-port 1000BASE-T/ SFP combo ports with 12-port 10GbE uplink, enabling superior network agility and easy network integration. 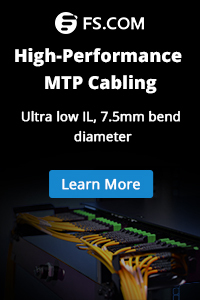 The 1000BASE-T copper ports utilize RJ45 interfaces and support Gigabit speeds over CAT6 LAN cabling up to 100m, while the 1G fiber ports can be connected to other devices via SFP optical transceivers over single-mode or multimode fiber patch cable. This 12 port smart managed switch also supports hyper-converged infrastructure, which allows users to reap the promised benefits of scalable network performance, efficient management and simplified deployment. FS S5800-8TF12S smart managed switch is designed to support a demanding and dynamic environment of SMB networks. With which, you can build a high-availability network that is fast, reliable, and offers redundancy to minimize downtime. The benefits of this smart managed switch are presented as following. Affordable 10G network for SMB: To catch up the bandwidth requirement of rich network applications, SMBs are constantly facing increased expenditure. FS S5800-8TF12S 12 port smart managed switch is designed to overcome the challenge, which features 8-port 1000base-T/ SFP combo ports and 12 10G SFP+ uplink, offering additional resiliency for complicated deployments. The port design makes it the ideal choice for business looking for an affordable switch solution. Smart management and simplified operations: This 12 port smart managed switch can be managed by Web interface, Telnet, SSH and SNMP, providing a good way to step into network management. With Lay2/3 switching capacity, FS S5800-8TF12S is able to function as an aggregation/access switch, making it the cost-effective switching solution for SMBs. Besides, the link aggregation features makes multiple ports behave like a single super-port for trunking and backbones, while the VLAN-enable helps to segment your network for performance and security. Seamless integration: This 12 port smart managed switch comes with a combo design: 8 1000BASE-T RJ45 ports capable of connecting to existing CAT5 twisted-pair cables, and 8 1000BASE-X SFP ports for optical transceiver working on fiber. 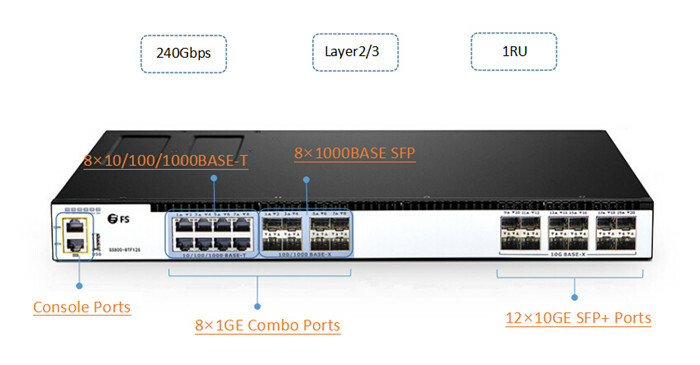 While the additional 4 10G SFP+ ports for 10G-enabled devices. This means it provides a more flexible solution for upstream or downstream server connections, making network administration easy. Smart managed switch forms a solid foundation for high-performance and scalable network for SMBs, while enabling enough space to expand as your business grows. With FS S5800-8TF12S 12 port smart managed switch, 10-gigabit is made affordable and accessible. And owing to the backward compatibility of 10G, you can prepare your network for future growth and to embrace tomorrow’s bandwidth-intensive media applications. If you have high load networks or time critical applications, it’s time to consider FS 12 port smart managed switch! This entry was posted in Enterprise Network, Network Switch and tagged 10GbE switch, 12 port smart managed switch, smart managed switch. Bookmark the permalink.